A container full of debris was parked outside 105 Columbus N.E on Monday. The sedan with out-of-state plates was missing its right front wheel. One of my regular bike routes takes me around the corner of First and Columbus in east Albany. 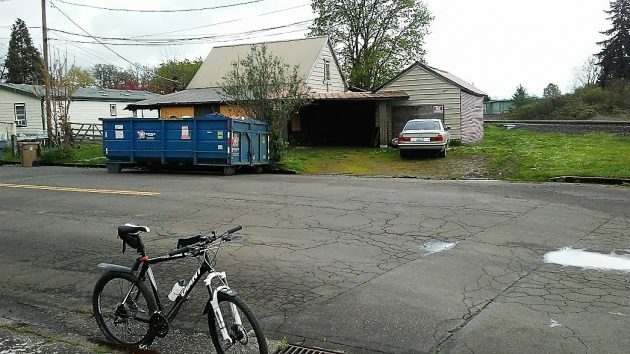 This week a house there had been boarded up “by order of the Albany Police Department,” according to the stencils on the plywood sheets covering the windows. “The house was boarded up based on its multiple violations and qualifying as dangerous,” Schendel wrote in an email. “All bedrooms within the house had been modified and had become uninhabitable due to egress and ingress issues, no smoke detectors, electrical, etc. The city has the authority to close buildings it declares to be dangerous, usually because of neglect or lack of maintenance, or because they were trashed by squatters, or because partitions were done without regard to any safety codes so that people inside would probably die if a fire broke out. Last month the city council passed an ordinance on securely boarding up houses that have been closed or abandoned. This place at 105 Columbus N.E. is right next to a couple of railroad tracks. It was built in 1937 and measures 576 square feet, according to county tax records.